If you're looking for printable Christmas word searches, and are also partial to crosswords and mazes, then there's a great-value pack of printable Christmas puzzles designed just for you! Python Printable Games specializes in printable activities for all occasions, including trivia, party games, gift exchange games and word games. Their puzzle pack consists of 12 printable puzzles (one for each “day of Christmas!). 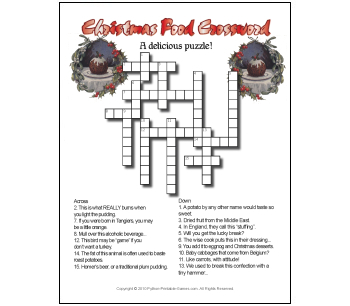 There are four printable word search puzzles, which have graphics behind the grid to continue the holiday theme. Snowman Seek and Reindeer Word Search are just for kids, while Treats for Christmas and Christmas Movies word search are suitable for older players. 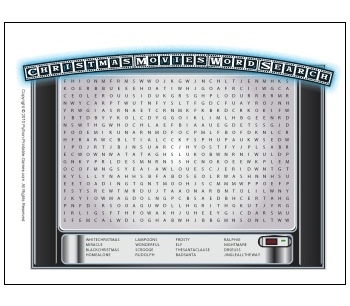 In addition, there are five crosswords and three mazes, all suitable for different age groups. 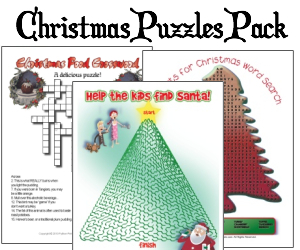 The Printable Christmas Puzzles pack of 12 games is just $6.95. The puzzles are “shipped” by email. You simply download, print and play! These puzzle are part of Python's MEGA-Pack. You can get all of Python's Christmas and New Year games for just $19.95. 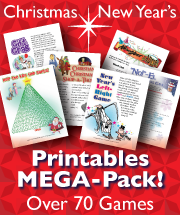 That's more than 70 printables, including coloring pages, paper dolls, all 20 printable Christmas Trivia games, loads of party ice-breaker and gift exchange games, mad libs, all the printable word searches and puzzles, and much more!